When most Americans start looking for their roots, they probably begin by leafing thorough family photographs or talking with family members. But black Americans are reefed intricately between a montage of history books and countless unanswered questions. As a descendent of African slaves and white Europeans, the disconnection from my roots comes full circle on the sand where I’m standing now: in Elmina, Ghana. I’m sweating, thinking of ancestors who 400 years ago were so violently deracinated from their homes, and scattered around the world. Anger and sadness play tug-of-war for my unknown relatives in Cuba, Haiti and Brazil. But the winds of the Atlantic comfort me. I exhale, and release all the horror of past transgressions. It is only through this journey home that I can find peace. It’s my own Sankofa. That’s the word in the local Twi language for going back to your roots. African-Americans like me pilgrimage to Africa each year, hoping to bring closure to our tumultuous past. So many tourists and new permanent residents have arrived that Ghana has developed special outlets to welcome us. “Our people really have no clue as to what Africa really has to offer,” said Jerome Thompson, 64, president of Ghana’s African-American Association. Johnson, who once lived in Fort Washington, Maryland, said he decided to move to Ghana after he discovered, during visits with his church, how culturally rich the country was. “If African-Americans come over with their knowledge, patience, expertise, and work together with the Ghanaians, there’s nothing that they won’t be able to obtain here that they couldn’t do in America,” he added. Noticing the Diaspora connection with Africa, Ghana’s Ministry of Tourism and Diaspora Relations created the Joseph Project, to build upon pan-African foundations in the spirit of American civil rights leader W.E.B. Dubois, who took Ghanaian citizenship, and Ghana’s independence leader and first president, Kwame Nkrumah. The project’s primary goal is to celebrate Ghana’s 50 years of independence, and to use 400 years of slave trade, colonial exploitation and cultural economic strife as a springboard for Africa to reunite with the African Diaspora. Capitalizing on Ghana’s appeal to African Americans also seems a perfect vehicle for promoting economic development. 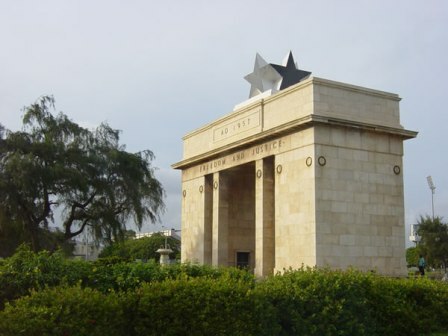 Some 5,000 African Americans are said to be living in Ghana. “The AU (African Union) fervently wants to make the Diaspora a 6th region of Africa,” said Dr. Erieka Bennett, founder of the new Diaspora African Forum in Accra. There are even plans to introduce a diasporan visa, a lifetime visa for those with African roots. The beautiful plush landscape and black cosmopolitan feel of Accra seems to make the transition easier. And the Ghanaian community embraces the diasporas warmly. Despite 400 years of slave trade, 210 million African lives lost, and a complete disconnect from cultural identity, the African spirit has proven resilient. As I peer into the night sky and reflect upon my experience here, something in the distance catches my eye. It’s a curious celestial phenomenon, on a canvas of green, yellow and red: the Black Star of Ghana. The star is a symbol of hope and life – perhaps a sign to the diasporan of our connection to our beautiful Mother Afrika.